With my 19th birthday coming up, I wanted to take the time to reflect on what I’ve learned this year and how much I’ve grown and changed. If you have a December birthday like me, you know it can be a pain to always have your birthday around Christmas break and to always get gifts combined with Christmas presents! 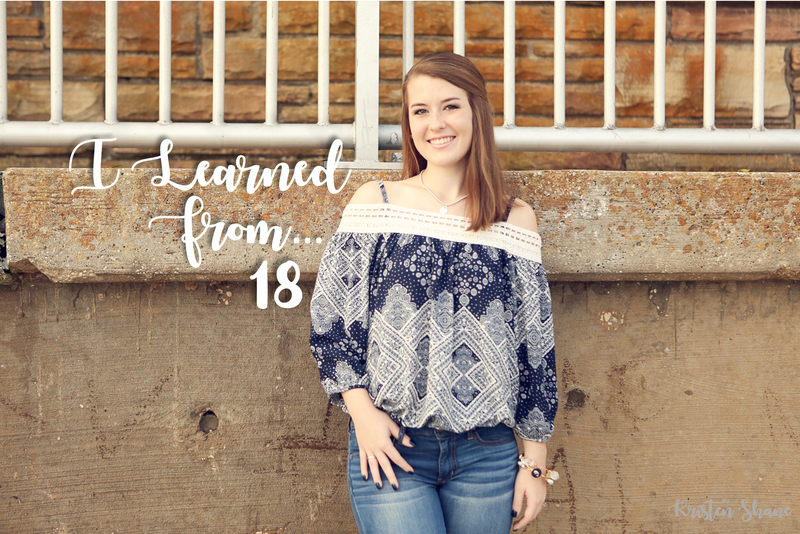 However, I do like that my birthday falls towards the end of the year, because it gives me the opportunity to look back and reflect as I celebrate another year of my life, so here’s some of the things I learned from my 18th year. Like many of the things on this list, this is something I wish I could’ve learned sooner, but the lesson came with experience. I had a few friendships that didn’t make it through this year, and I’m okay with that. I learned that there are certain toxic, negative people that I don’t need around me. Loss normally isn’t thought of as a good thing, but if you lose negative people, it’s actually a gain. Sometimes, it seems like everyone is talking but no one is listening. Every person knows something you don’t. I believe that every person that comes into your life has a lesson for you to learn (and as I mentioned above, you might learn from their absence). Truly listen and be present, as you’d want from someone listening to you. Don’t let comparison be the thief of your joy. It’s a big world out there, and it seems like everyone is doing something amazing. I’ve learned to be conscious in comparison and realize that everyone has their own life to live. Learn from the people who are doing what you want to do, and you never know, people may be looking at you for inspiration, too. It is a beautiful thing to love who you are. I have come so far in the areas of self-image and self-confidence, and that has been such a blessing for me. It’s a tug-of-war between being who you are and wanting to fit in, but I’ve found it much easier to love who I am now that I’m in college. People are much more accepting of everyone as an individual and I love that. Life would be horribly boring if it always stayed the same. This year,I graduated high school, moved away from home, and started college. Those are changes that can be massively scary for people. I embraced the change, and I’m thankful for the turns my life has taken. Change can be scary, but I’ve found that the best things often happen outside your comfort zone. Amidst the whirlwind of life, family and faith are constants. I have only grown closer with my family since I’ve moved away from home. Since I don’t see them every day now, it makes the time I have with them even more special. I’ve learned to appreciate everything my parents and grandparents (who may be the biggest fans of my blog, and I love them even more for it) have done for me, and how much wisdom and advice they have to share with me. Faith is my rock, and I won’t be shaken from it. My faith has only grown since I’ve come to college. I’ve learned that my friendships with people who share my faith are very important to me, and I continue to pray for my future spouse out there, and I hope he’s growing in faith, too. There is really no time like the present. Life is short. If you want to do something, do it now. There is no better day than today to start whatever it is you want to do… (For me, that was starting this blog!) Time is much too precious to waste. Every cloud has a silver lining. The glass is always half full. It may sound like an exaggeration, but positivity kind of changed my life. The past two years, I’ve struggled a lot with anxiety and self-image, and I think a lot of it stemmed from high school and the bubble I felt like I was stuck in. I have some wonderful friends (and my amazing sister) who’ve never stopped believing in me. I made a huge personal effort this year to choose to be happy because it is good for my health. And it worked. I would much rather be a positive person and always try to look on the bright side. It’s not always easy, but it’s always worth it. Don’t be afraid of knowing what you want. In high school, my friends didn’t know what college they wanted to go to, what major they wanted study, or what career they wanted to pursue, and I did. It’s weird to say, but sometimes it felt odd to be the one that knew what I wanted and where I wanted to go, but I learned that I don’t need to be on exactly the same page as everyone else. Run towards what you want and who you want to be, and don’t stop until you get there. Literally. If you want to run a 5k, run. Keep running. If you know what you want, work and work and work hard until you get it. Don’t worry about who’s ahead of you. Don’t worry who’s behind you. Don’t worry if you trip and if you stumble, make it part of the dance. I’ve finally gotten into a regular workout routine, which has been a goal of mine for a long time. There are so many great benefits to working out, and it’s also a good way to clear my head, while helping out my body. I don’t want to be one of those people who regrets never working out or is never able to “fit” it into my routine. This year, I made fitness a priority. I’m still making progress, and I’m proud of that. Hand your life over to God, and you won’t be disappointed. Sure, things won’t always go your way and you won’t always get what you want, but that’s kind of the point. He has got the most perfect plan worked out for us, and it’s much, much bigger than what we can see now. People aren’t always going to like you, but don’t let them stop you. Sure, you’re going to meet people who you don’t like, or who don’t like you. They might say mean things to you, or try to break you down. Don’t let them. Be confident in who you are, try your best not to let them get to you, and keep holding your head up. Hitting the milestone of high school graduation gave me time to reflect on how far I’ve come and who helped me get to where I am. You can’t do anything all on your own, so don’t be afraid to ask for help and thank the people who’ve helped you. Don’t ever let the world make you cold. Just reading the daily news headlines can be chilling. The world can seem like a dark, scary place, but it also isn’t totally a dark, scary place. You can’t live in fear, and you can’t let the hate or horror of the world steal your light, love, and joy. Baby steps in the right direction are still steps in the right direction. Sometimes the hardest part is just getting started. It doesn’t matter how fast you go, as long as you do your best, and keep moving forward. Acknowledge your blessings, and be thankful for them. If you’ve read some of my other posts, you know that I am all about the little things, and the big things, too. I have learned to appreciate all the good things in life, big and small. A little can go a long way. A little love, a little kindness, or a little thankfulness. This post is a little longer, but thank you for reading! I hope you can take the time to reflect on some of the things you’ve learned this year, too. Kristen, you write like a person who has lived a lot longer than your 19 years. Most people don’t find out or realize the things that you are saying until much later in life. Unfortunately many never come to this understanding. I can see by your reflection on life that you have an understanding far beyond your years. With your detemination at this time I hope I am around to see your accomplishments as you go,through life, your career, your spouse and the impact you have in this troubled world. You will face many disappointments in life but with the attitude that you project I am sure that these will be only small bumps in the road to a future that will make everyone proud. Keep up the good work and keep God as your guiding light. Thank you for your support, Grandpa!! I’m very lucky to have some amazing people to learn from and look up to. I truly appreciate your support of me in everything, and with this blog! I’m doing my best to learn all I can and keep following God’s plan for me. Blessings! That makes me happy to hear. Glad you enjoyed it! Thanks so much! I’m glad I’ve come to learn this, and I hope to live the same way!